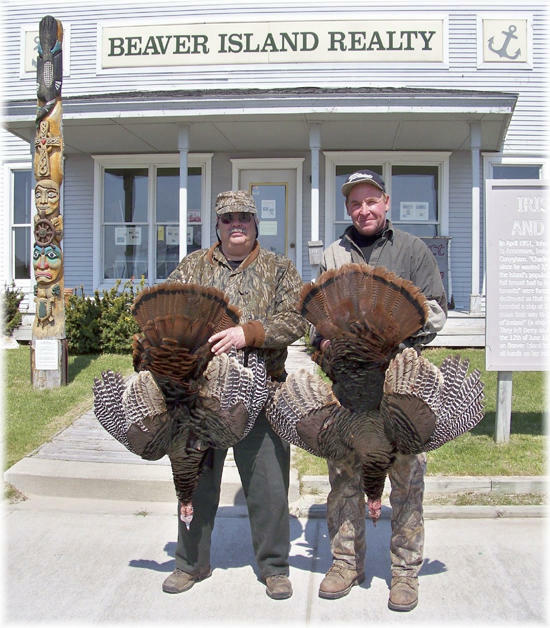 BEAVER ISLAND, Michigan — This big island in northern Lake Michigan has long been known as a summer destination, but it is also a good place for turkey hunting. We discovered that last week when four of us from Southeast Michigan hunted on the island and took four large gobblers in just a few hours of hunting. We saw dozens of birds and found it remarkably easy to get permission to hunt on private property from everyone we asked. Hunting with me were Bill Teer and Tim Freathy, both of Grand Blanc Township, and Mike Salter of Livonia. We stayed with a friend, Mark Valente, a trapper who has lived on the island for more than 30 years. He lives near the island’s southeast coast and knows the island like the back of his hand. He gave us good advice about where to hunt and arranged to get us permission to hunt on several farms or vacant property. We also got help from Steve West, director of the island chamber of commerce, and Mark Lafreniere, a Beaver property owner. West estimated that at least 1,000 turkeys are on the island, which is nearly 14 miles long and 5 miles wide. The three also helped us in February 2008, when Teer and I and two other men hunted coyotes on Beaver Island. Teer, 51, and I hunted for turkey together May 12, with Teer doing the calling. We got permission to hunt on private land where we had seen two large gobblers May 11. Long before dawn May 12, we set up a pop-up blind on the southeast side of the island, and we weren’t greatly surprised when Teer’s first calls resulted in a thunderous gobble within 100 yards or so behind us. That gobbling kept up for nearly an hour before we heard at least two gobblers leave their roosts and crash to the ground. For 45 minutes, Teer called repeatedly to the toms, who got within 70 or so yards of the blind before they seemed stuck somewhere behind us. At one point, Teer peeked out a side window and saw a large gobbler strutting back and forth with his tailfan spread behind him. The bird was about 60 to 70 yards behind us, apparently on the other side of a creek we didn’t know was in that area. The gobblers never moved forward, and we left after another hour of frustration. We decided to drive by a farm where we had seen several gobblers strutting in the middle of a large cut-over wheat field the day before, and we found the same situation again, only with seven or eight large gobblers with bright red heads strutting some 150 yards away. We stopped to ask permission from a man tending a garden near the field, and he not only gave us permission with a smile, but also told us where to park our truck and how to sneak into the woods where we could call in the birds. Not five minutes later, we were standing in the middle of the woods trying to figure out how to proceed when Teer spotted the birds walking toward us. He wanted to sit against a tree, but I urged him to reconsider, given that we were in wide-open hardwoods with little cover. Teer agreed and hurriedly stuck his decoy into the ground a couple of feet away, making sure the fake hen would be visible over the wall. We both kept our heads down behind the wall, but I sneaked in a look every 20 seconds or so as the gobblers marched toward us in a V formation. Teer was raking the dead leaves with his hand as he called, making it sound as if a hen were scratching the ground to feed. When the toms got within 30 yards, we both raised up behind the wall and started shooting with our 12-gauge shotguns. Teer’s bird was down flapping his wings immediately, while mine ran off wounded. We both jumped up and chased him for 50 yards or so before Teer finished him off. They were both nice gobblers, more than 20 pounds with beards at least 8 inches long and long, sharp spurs. After buying a 12-pack of beer for the gardener, Bob Evans, we headed for Valente’s farm, where we discovered that Freathy had killed a nice gobbler, too. Freathy, 56, who has been a Michigan turkey hunter since the mid-1970s, said he and Salter were sitting together in a blind when a gobbler with two hens came up behind them after an hour of Freathy’s calling. Salter couldn’t get turned around for the shot, so Freathy took the bird at 40 yards with a 3-inch load of 5-shot. Salter, 50, got his bird the next day when Freathy called in three gobblers across 150 yards of open field, and Salter dropped the biggest one with one shot at 20 yards. Both of their birds were about 20 pounds each with respectable beards. Salter, who was on his first turkey hunt, said he enjoyed the experience. Teer said he appreciated the kindness of everyone on Beaver Island. “This is one of the friendliness places I’ve ever been,” he said. “Everyone waves when they drive past you on the roads, and people are not only happy to give you permission to hunt — they give you advice on how to hunt their land. “We were never turned down once on a place to hunt,” he said. Teer said he was also impressed with the size and number of gobblers on the island, which doesn’t have as much hunting pressure as mainland Michigan.